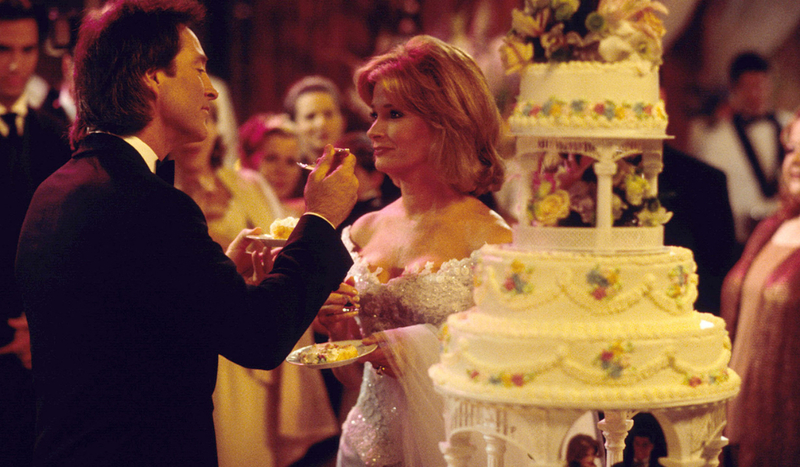 John and Marlena’s wedding ceremonies always make fans tear up. Soaps.com takes a look back at John Black and Dr. Marlena Evans, “Jarlena’s” vows, in anticipation for their August 22, 2018 wedding, which promises to be an old fashioned wedding with Marlena wearing a white gown, and rumored to be filled with shockers. 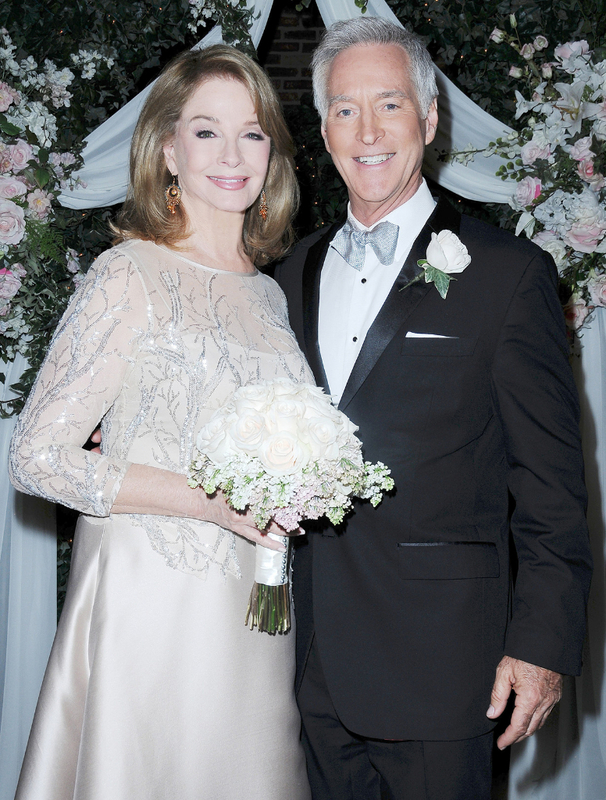 We’ve updated below with John and Marlena’s newest vows from August 22, 2018. Marlena married Roman, who was actually John Black, on August 22, 1986. The song, “Up Where We Belong,” was sung by Marlena’s friend, Tamara Price, who was played by Marilyn McCoo (Lani Price’s mother). Incidentally, this song was also sung at Roman and Marlena’s first wedding in 1984 by Doug Williams (Bill Hayes). Marlena: And no one will ever love in the same way after us. 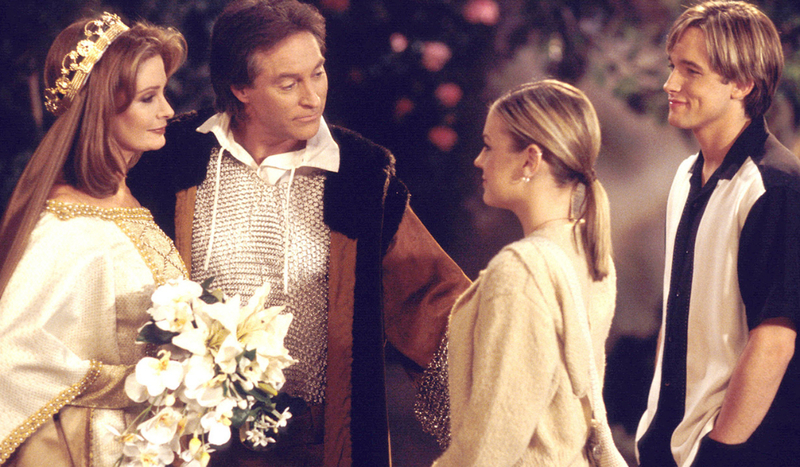 After John and Marlena said their “I Dos,” they had some vows of their own. John and Marlena lit the center candle of the bouquets to symbolize the unifying power of their love, joining their family together. Everyone reads from First Corinthians: Love is patient, love is kind, it does not envy, it does not boast, it is not proud, it is not rude, it is not self seeking, it is not easily angered, it keeps no record of wrongs. Love is not delight in evil, but rejoices with truth. It always protects, it always trusts, it always hopes, it always perseveres. Love never fails. 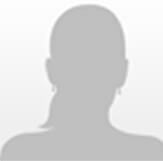 Marlena: John what I chose to say to you is from the Song of Solomon. It signifies to me the end of bad times, the beginning of the good times. Rise up my love, my fair one, and come away, for lo the winter has past, the rains are over and gone, the flowers are appearing on earth, and the time for signing birds has come. My beloved is mine, and I am his until dawn breaks and the shadows fade. Turn my beloved and be thou ever mine. I really do feel as though our winter has past, our bad times are over, and the good times are beginning. Now I know that nobody can ever promise what the future will bring, but I will make you one solemn vow. I will love you no matter what, whether rain or drought or sun or storm, whatever comes, I will laugh with you, weep with you, celebrate with you, and mourn with you. Whatever comes, I am yours my love, until death part us. John: No wonder we are getting married because I chose a poem also. It is about a hundred years old and what it does is capture the essence of how I felt the first time I saw you. And I was never struck before that hour with love so sudden and so sweet. Her face it blossomed like a flower and stole my heart away complete. Are flowers winters choice, is loves bed always snow, she always seemed to hear my silent voice let loves appeal to know.I never saw so sweet a face as though before me stood. My heart has left its dwelling place, can return no more. That sums it up Doc. I fell in love with you the first moment I laid eyes on you, and from that moment till now, well I think it’s safe that a lot water has gone under the bridge. We experienced sadness, a lot of pain, but somehow through it all our love was strong enough to endure, and everything we’ve been through. My love for you has never changed, and I know it never will. So that brings up to today, and I can stand here in front my family, and my friends, and I can promise you that I will love you until I die. I am going to be a good husband to you. I am going to honor you, I am going to protect you, I’m going to care for you, and I’m going to make your cares my cares, I’m going to make your sorrows my sorrows, and by damn I’m going to make your triumphs my triumphs. And I’m going to grow old with you, and love and joy in all the great stuff life has to offer, until death parts us. John: This gold ring is a symbol of my love and fidelity to you, it’s made from a precious metal, in the shape of a circle, which has no beginning and no end. And so is my love for you, it is precious and never ending. As this ring encircles your finger, never forget that your love encircles my heart. Marlena: This gold ring is a symbol of my love and fidelity to you, its made of precious medal, formed in the shape of a circle, which has no beginning and no end. As my love for you, it’s precious and unending. As this ring encircles your finger, always remember, your love encircles my heart. John: I am the luckiest man in the world because you are standing right here beside me, and you’re still here, even after I broke your heart. Now I would give anything to undo what has happened, but I can’t do that. All I can do, Marlena, is promise that I will fill today and all of your tomorrows with so much love that the pain of yesterday will simply fade away. I pledge my devotion, my entire life to repairing and restoring our marriage, and our family. God is my witness, I will never let you down or cause you one moment of pain ever again. Marlena: We always find our way back to each other. There was a time last year when I was not sure we were going to make it. But the vows we made to each other carried me through. The worst has come and gone and I still love you more than ever. I will always love you and I promise I will never ever give up on us. Abe Carver presides. Abe begins. “We are gathered here today to join John Black and Marlena Evans in matrimony. John says, “Abraham. I think Doc and I have said all the important stuff to each other already. And because of her suspect stamina, what do you say let’s get right to it.” The best man, Paul, gives John the ring. John says, “You know because of what’s happened the last time we tried this I have much more of an appreciation of what these vows mean so I John Black take you Marlena Evans as my lawfully wedded wife. To have and to hold from this day forward. For better. For worse. Richer or poorer. In sickness and in health. Until death do us part.” He kisses her hand and slips the ring on. Written by Christine Fix December 24, 2006. Refreshed July 1, 2018, November 8, 2018.